Goal setting is one of the best ways to achieve success. But if there was an easy formula to create startup success, everyone would be following it. Business schools could stop teaching and no young business would ever fail again. Clearly, that is not reality. Startups fail at a rate of about 50% in the first 5 years and it's not through lack of trying. Goal setting is an important activity that can affect success. But not all goals setting strategies are equal. This article aims to debunk some goal setting myths and to suggest better ways of moving your startup ahead. A popular piece of startup advice is to visualise your success. Sports professionals, public speakers and actors all benefit from the act of visualising their success. Before a match or a public event, these people picture in great detail how they would successfully overcome obstacles and revel in their glory. Business coaches have adopted this technique and encourage their entrepreneur students to create vision boards and indulge in fantasies of the life they desire. The problem is that this often amounts to nothing more than daydreaming. And just like you cannot win the lottery by visualising it, you cannot create a business by simply imagining your success. It is important to realise that the professional athlete, the speaker and actor are not dreaming; they are practising in their mind. They have already reached a high level of mastery of their skill and visualising their goal is not fantasy. The athlete mentally practises the exact moves required to defeat their opponent. The speaker practises breathing and talking calmly in front of a crowd. And the actor internalises his lines and practises in his head the perfect delivery. This is different from imagining how we would feel if we created a successful business that made us rich. Studies into positive fantasies show that visualisation can even be counterproductive for achieving goals. Kappes and Oettingen discovered that through visualisation we trigger our brains to respond as if we had already achieved our goal. They found that mentally indulging in a desired future led to low energy and poor achievement. 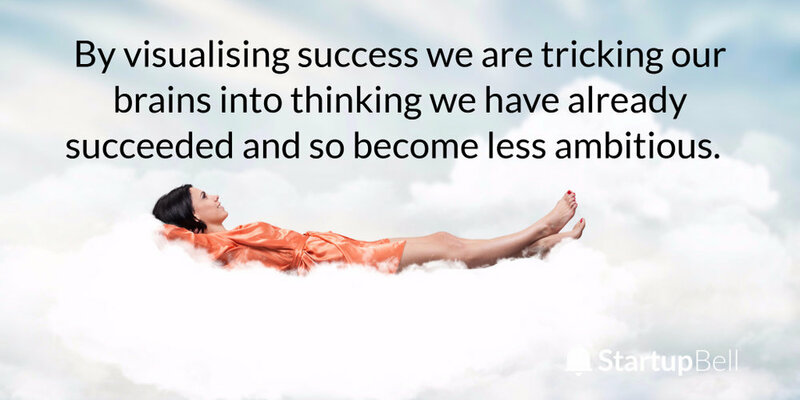 By imagining, we are tricking our brains into thinking we have succeeded and so become less ambitious. Visualisation creates a decrease in our body energy which explains why it is so useful for speakers and actors: it reduces anxiety, the unpleasant energy we want to let go of. In business we need high energy, high motivation and a positive mindset. Only when we use visualisation to help us take effective action does the technique become useful for goal setting. For example, if your progress is held back by self-doubt and thoughts of “this is too hard” or “I can’t do this”, visualisation can help you overcome these feelings. But experts like Dr Russ Harris suggest the trick is not to imagine yourself feeling relaxed and confident. Instead like the athlete concentrate on your actions. Rehearse in your mind to take actions to the best of your ability. This will bring you closer to your goal. Since starting your business by visualising success is not the best way to begin, the question arises what is the best way to ensure success. I would suggest the most important thoughts before starting a business should focus on your values. I have written previously about the importance of understanding your purpose in life. Your business goal cannot contradict your life-goal, or else you would waste energy by battling yourself. Defining your life-goal and aligning your business goal with it has one great advantage. You are less likely to choose extrinsic goals like fame or money. A meaningful goal for your business and yourself as a person has to be intrinsically motivated, because building a business requires energy over a long period. Without the right motivation you cannot sustain the drive needed to reach your goals. You may have heard before, if you want to succeed in business you need determination, grit and stamina. This strength comes from a true belief. You must value your goals. The other advantage that valued goals bring is that you can concentrate on your efforts on the process. Many experts argue that the focus on the journey rather than the goal is what brings a sense of fulfilment and success. On one hand, studies have shown that people are much more likely to succeed if they have a clear goal in mind. On the other hand, experts like Ken Robinson argue that people become extraordinary because they enjoy the process, they have no goal. Often exceptional achievers had no idea of their capabilities when they started out. So what is it the goal or the process that matters? You need to realise that every goal we want to reach comes at a price. Becoming a doctor means forgoing years of partying and instead studying to memorise large amounts of knowledge to pass the difficult exams. The price entrepreneurs pay for the opportunity to give their idea a go is arguably much higher. This is because there are no courses, no curriculum to follow, no previous exam questions to guide them. And there are no guaranteed outcomes. An entrepreneur has to accept that the business may fail, leading to a loss of time and money invested in the endeavour. 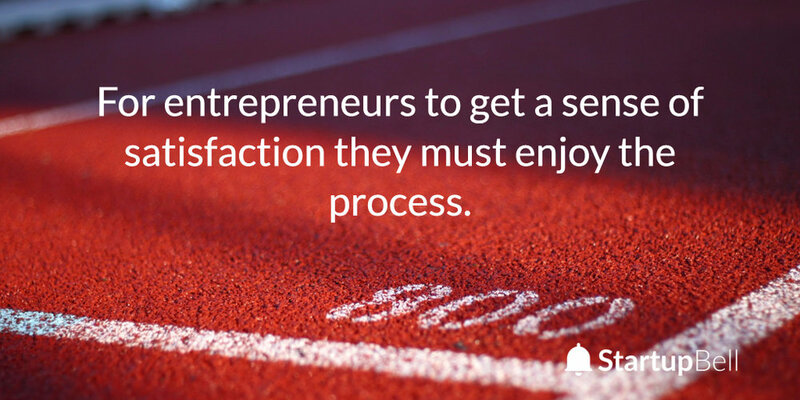 This also means for entrepreneurs to get a sense of satisfaction they must enjoy the process. The reward has to be the act of overcoming the hurdles. Entrepreneurs can choose the hurdles they want to overcome by choosing their goals. But ultimately they have to pay a price in the form of effort and time. Luckily we are living in times when it is possible to have many different careers in our lifetime. This never used to be the way. Previous generations were born into a profession without any choice of changing jobs to improve their lives. Only recent generations were able to choose their career regardless of their parents’ profession. But despite having the option to pursue different careers in our lifetime, it makes sense to choose the right career with the right goals as early as possible. This is because the more time you have to perfect your skills the more you are likely to achieve. Ultimately you will only be able to pursue the aim of a lifetime if you enjoy the challenges along the way. Which leads me to the next thought: what if you find a better way to reach your life goal? Entrepreneurs often hear the advice to keep an open mind and embrace opportunities. A popular example of a missed opportunity is Kodak. They missed realising the power of digital photography and instead followed to their detriment the goal of being the best photography-film maker in the world. I think this is a case of denial rather than a missed opportunity. Still, it is important to be aware of what is happening in the world to spot opportunities. But constantly looking over your shoulder and thinking the grass is greener on the other side can be distracting. Some experts suggest that entrepreneurs must resist impulsivity, the urge to allow ourselves to get distracted. So what is the best action? Welcome opportunities or follow a goal without being distracted? If we channel all our energy into one important goal we use more of our energy effectively. Having just one lifelong goal offers the best opportunity to reach the highest potential. That’s because mastery usually requires years or decades of dedicated practice. If we want to create a business we are proud of we should identify the right goals carefully. Once we are certain, we should follow our path at the expense of all other possible paths we could have followed. Some business advisers suggest to write a list of 25 goals and then to select the three most important ones and focus on these. The remaining 22 goals are the enemy of productivity because it is these that distract us from reaching the three goals we identified as the most important. We need to decide which goals we want to aim for. If we don’t make the choice and keep all options open it is holding us back. Ambivalence can ruin startups. If we want to reach our goals we need to understand that there is a trade-off. We need to accept the sacrifices that come with any outcome we strive for. We need a clear vision of the journey and we need to be happy with the chosen path, the likely obstacles and the possible failures. Mostly we need to understand the difference between a real opportunity and a distraction which stops us from achieving our goal. Often we chase so-called opportunities because it is an option to leave the chosen path when we face a difficult problem. We must learn to distinguish between real opportunities and distractions. Opportunities lead us to our valued goal faster. Distractions lead us towards a goal that we never attached great meaning to previously. Some entrepreneurs talk about the importance of moon-shots or "big hairy audacious goals". These are goals that are so crazily high that they aren’t realistically achievable. These lofty goals are useful in two ways. If you can envisage the goal and accept the price you have to pay to get there, you are mentally preparing yourself for the quest, the journey with unknown outcome. You embrace the journey because it gets you closer to your lofty goal even though you may never reach it. You understand that what matters is the process of getting closer not the goal itself. The second reason why moon-shots are useful is that people do what we believe to be impossible all the time. It is how we break through impossible barriers. For many years the medical and sporting community accepted as fact that nobody could run one mile faster than in 4 minutes. But once the record was broken in 1954 by Roger Bannister, the impossible ceiling was removed and several other runners managed to run faster than 4 minutes within the following few months. It is crazy that our brains can keep us captive by knowledge that is wrong. But while big hairy audacious goals are useful for sending us into the right direction long-term, we also need the exact opposite: tiny goals that are realistic and achievable. In his book “IBM: How the world’s most successful corporation is managed” David Steuart Mercer wrote about one of the most successful sales teams of all times. IBM thrived because their sales goals were set so 80% of employees could easily achieve them. The management would set very short-term (daily) goals that were realistic and by doing so create motivation to reach them. Often the team managed to exceed them. So the business advice of setting big goals and breaking them down into doable chunks is not entirely correct. Rather you have two different types of goals. Unchanging goals that lead the way and small achievable ones to keep you motivated. Business advice for entrepreneurs can be contradictory. I have often found when there are two schools of thought the truth is often in the middle. And seemingly opposing ideas can both be correct when put in the right context. When it comes to goals it is worth understanding what the advice is and to seek examples where it was successful. This way you will be better able to choose which advice to follow. Remember, there is no guaranteed formula. Whatever goals you set yourself, whichever advice you choose to follow, you will only succeed if you take action consistently. You cannot think yourself to success.